Problems cascading balanced scorecards and how to avoid them. Finally, you can think of the organisation as a social system that supports decision making. Looking at things this way, will dramatically change how you think about designing, implementing and using strategy maps and balanced scorecards. 1.2. Rule 1: Do not create a balanced scorecard for an organisation. Yes really! I have a golden rule. You do NOT create a balanced scorecard for an organisation. What you do is to create a set of strategy maps and balanced scorecards for the various teams. When these are put together, you end up with a set of strategy maps and balanced scorecards for an organisation. What you see in many examples is what is described as “The organisation’s strategy map and balanced scorecard”. These are actually for the senior management team. What you are not seeing in these examples are the many lower level strategy maps and scorecards that make up the whole set and support the top-level ones. Have a read of “Don’t do a balanced scorecard for an organisation”. This seems so obvious when stated. However, so many people try to create one single, overall balanced scorecard for their organisations. Guess what: they run into the “Which of these 97 measures should we cut down” question…”. What they are doing is missing the fact that these are a set of decision making tools for people in teams. The design is much more about the scope of decision making of each team and how you enable and support their decision making. And if you want to understand the connection to better decision making better, (which frankly this is all about), then have a look at the Decision improvement zone. To create a set of strategy maps and balanced scorecards you need to think about the architecture of that set. How that reflects and will communicate your strategy and strategic themes and goals. 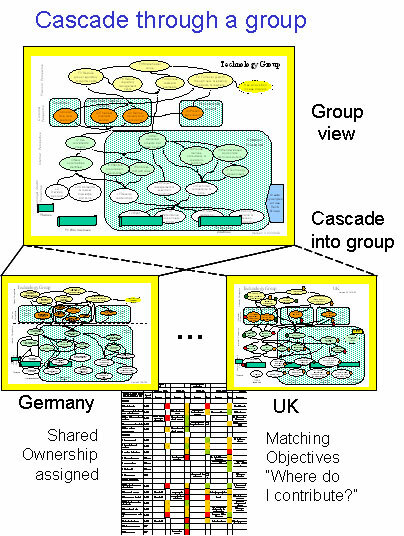 Cascading strategy maps through an organisation, in this case to international business units. There are lots of ways to design the strategic themes of your strategy maps to communicate how you want the organisation to be aligned in the future. Some align around processes, some existing functions, some around the joined up collaboration they want. Sometimes the strategic themes represent contrasts between old and new strategy: old company vs new company, old products and new, or old customers and new. Some strategy maps are aligned around the customers objectives. Others are simply costs vs revenue. It all depends on the strategy and what messages the organisation is trying to communicate. No one approach is right. There are lots of ways to do this. In Strategy Mapping for Learning organisations I devote a whole chapter to designing the framework of strategy maps and provide eight or nine typical models that these take. There are some easy guidance to follow when thinking about how to cascade your strategy maps and balanced scorecards. Here is a useful article that describes three ways to think about the design of your balanced scorecard cascade together with some links to examples on this site. Your people need to see and appreciate how they fit into the strategy. There are some vary basic things you can do. For instance, Strategy maps and scorecards need an organisational purpose at the top. However, it is not that simple. One part of alignment is ensuring your people can see their role in the strategy. This is often referred to as Line of sight or the golden thread. Here is an article that explains these two: Line of sight and The Golden Thread: understanding the difference. For a more in depth view, there is a whole part of this website dedicated to communicating and socialising strategy. Have a look at the Communicating and socialising strategy zone. An important part of the development of your strategy and its implementation plans is to align the programmes of change, the projects and the initiatives. It makes sense to align the programmes of change and investment with your core strategic themes. The projects and initiatives can then be mapped onto the strategy maps, t the various levels, to ensure they support the strategy. This article is about aligning programmes and projects with the cascade of strategy maps in a strategic balanced scorecard. Overall alignment includes not just the projects and programmes, and investment themes. It includes aligned objectives, drivers of change, aligned budgets and even aligning your meetings around the strategic themes. 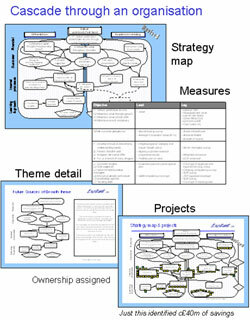 This article not only describes some of this but includes a picture of a cascade of strategy maps for an organisation. Have a look at Aligning the organisation with the strategy. These are part of the paradigm shift that supports Fourth Generation Balanced Scorecard thinking. Here balanced scorecards are social tools not technical tools, operating in social systems that support improved decision making in the organisation.